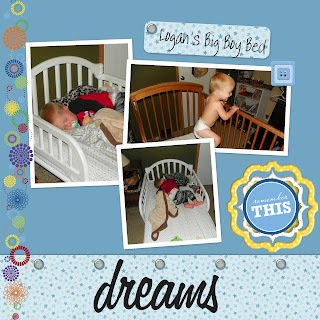 I told you yesterday all about finding a toddler bed at the TTB Kidz consignment sale. Well, believe it or not, I had the crib broke down & the new bed in place before lunch yesterday. Yep, little ole me, with lots of help from Makenzie & Logan of course. Logan was very excited about his new bed. He crawled all over it. He laid down in it. He seemed to like it. But I worried about him actually sleeping in it. I remember when we switched Austin to his big boy bed. He kept getting up over & over again for days. The only way I could get him to actually stay in it was to sit with him until he fell asleep. Then he would still come to my bed in the middle of the night. That was a long time in our lives. Although I still smile when I think about waking up to find him in bed with me or curled on his cot beside our bed. Makenzie wasn't a big deal. She has always wanted to be in her bed. So when we switched her, she went to sleep. She still woke up almost every night. But after a potty break, she went right back to bed. As nap time crept closer, I waited with silent apprehension. I waited, then I waited some more. I waited until Logan's little head was falling over. As I took him to his room, he said "no bed", and promptly went to sleep. Hmmm....can bedtime be this easy? Yet again, I waited until past Logan's bedtime before even attempting it. After all the kisses & good night rituals, I laid him down, tucked him in, walked out, & turned out the light. He was immediately at the door screaming. I knew it was too good to be true. So, I put him back in bed & sat down with him. I talked, I rubbed his back, I sang, I pleaded for over 20 minutes. He kept saying "night night", hollaring "oh toodles", or some other jibberish. I finally told him good night one last time & walked out, closing the door behind me. He fussed for a few minutes from his bed, but went on to sleep. I read an article several years ago about celebrating all the lasts. This is so true. We are always excited when a first happens, but we don't realize the significance of those lasts. Time passes far too quickly! Take a few minutes to enjoy it, just in case its the last time.